WASHINGTON, Sept. 15 (Yonhap) -- U.S. experts said they are viewing next week's third inter-Korean summit in the context of the current impasse in denuclearization talks between the United States and North Korea. South Korean President Moon Jae-in and North Korean leader Kim Jong-un will meet in Pyongyang from Tuesday through Thursday at their third summit aimed at dismantling the regime's nuclear weapons program and bringing lasting peace to the divided peninsula. 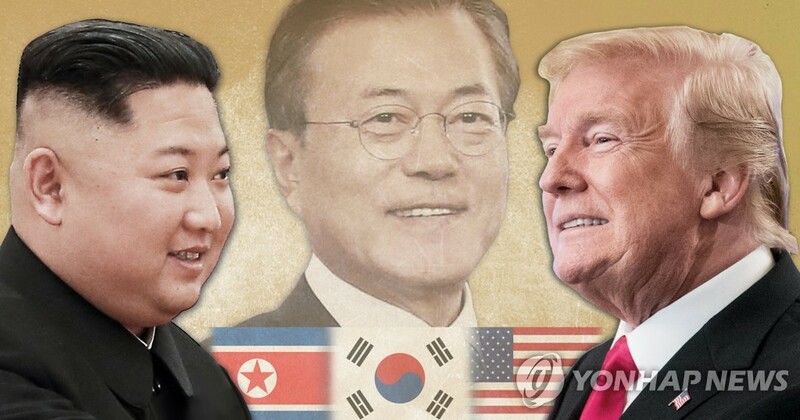 Their earlier meetings in April and May laid the groundwork for an unprecedented summit between the U.S. and North Korea in June, at which U.S. President Donald Trump and Kim agreed to the "complete denuclearization" of the Korean Peninsula in exchange for security guarantees from the U.S. But progress in implementing that deal has stalled amid an apparent tug of war over who should go first. North Korea demands the U.S. jointly declare a formal end to the 1950-53 Korean War, which ended with an armistice, while the U.S. demands an inventory of the North's nuclear arsenal. "Get clarity on what North Korea is willing to accept and concede on a whole range of options, not just an end of war declaration and a declaration of nuclear materials and sites," advised Frank Aum, a Korea expert at the U.S. Institute of Peace, in an email interview with Yonhap. "There are many different possibilities for what elements could be included in a deal -- such as exchanging liaison offices, freezing nuclear and missile production, humanitarian assistance, military forbearance and different sequencing of these elements," he said, adding it would be helpful for Washington to know Pyongyang's position on these issues. The White House said this week that Kim had requested a second meeting with Trump in a recent letter to the president, and that planning was already under way to make it happen. That gesture has begun to break the impasse in the two sides' negotiations, according to Aum, but there is more Moon can do in his upcoming meeting with Kim to smooth the terrain. "I think President Moon can play a helpful role in understanding Kim Jong-un's position, seeking creative solutions that are satisfactory to North Korea, relaying the U.S. position about the sequencing and merit of certain concessions, and expressing opinions about what things might be satisfactory to Washington," he said. "I also expect President Moon to seek bold concessions from Kim Jong-un that will give momentum to the U.S.-North Korea nuclear negotiations." Others were more skeptical of the progress that can be made at the inter-Korean summit, saying the U.S. and North Korea will have to resolve their problems between themselves. "At most, the inter-Korean summit can help facilitate a second U.S.-North Korea summit," Ken Gause, a North Korea expert at CNA Corp., said in an email to Yonhap. "But any breakthrough will have to be worked out between Washington and Pyongyang." Still, he agreed with Aum that Moon can help Trump and Kim better understand each other's positions and come to an agreement on how to break the impasse. But all sides need to take a step back from the current situation and reframe the way forward, he advised. "Instead of demanding verifiable steps toward denuclearization, the U.S. and South Korea should couch their demands in terms of a peace regime," Gause said. "This would allow Kim Jong-un to save face while making concessions. It avoids the current situation we find ourselves in, which is a zero-sum game." Robert Manning, a senior fellow at the Atlantic Council think tank, expressed reservations about Kim's will to denuclearize, pointing to recent reports that North Korea continues to develop its nuclear and missile capabilities. He, too, called on the parties to use more "political imagination" to craft a negotiating framework that involves proportionate and reciprocal actions. "President (Moon) has made progress on North-South reconciliation," he said. "But it is unclear how much further he can go without breaking the link to denuclearization."